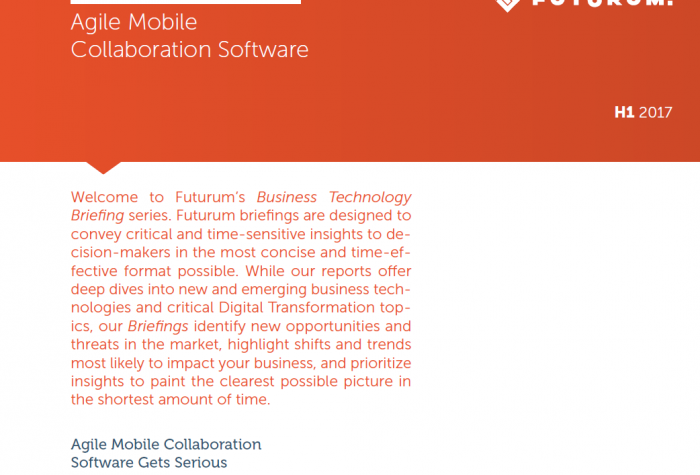 Our H1 2017 Agile Mobile Collaboration Software brief identifies both established and emerging agile collaboration products we think you should be aware of going into 2017. The products highlighted in this brief should help not only facilitate internal collaboration and simplify meetings, but also streamline communications, increase productivity, accelerate project velocity, and significantly reduce overall implementation and IT-related management costs. As we consider agile collaboration to be a foundational operational underpinning of every successful Digital Transformation initiative, this briefing should be considerable importance to CTOs, CIOs, CDOs, CEOs, COOs, and project managers. This briefing also addresses both the enterprise space and the SMB space.